Kasarna is a late Baroque building dating from the end of the 18th century. It is one of the oldest preserved examples of common workers’ flats in our country. Ironmaking families lived there until 1983. In 1985 it was listed as a cultural monument, renovated by the Municipality of Jesenice under the authority of the Institute for the Protection of Cultural Heritage Kranj. 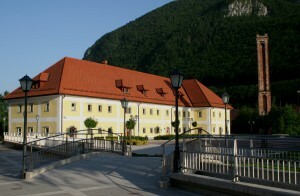 Nowadays it houses Music School Jesenice and Gornjesavski muzej Jesenice. Visitors can see a permanent ethnological exhibition which shows the lifestyle of ironmaking families and a reconstruction of a worker’s flat. Archive and photographic material of the Carniolan Industrial Company and photographs of the Ironworks of Jesenice are kept in Kasarna. Groups (10 or more people) can also arrange private tours outside the museum’s regular times – bookings must be made at least 2 days in advance (info@gmj.si).